I crazy about bronzers nowadays and these new Bourjois bronzers look decadent! With ingredients like Cocoa Bean & Elixir of orange blossom, I'm practically drooling. Add these to my never-ending wishlist! 2 shades to create a natural tan. A clever clamshell packaging so you can use them separately or together depending on your whims and seasons. Its texture and chocolate flavor is addictive. 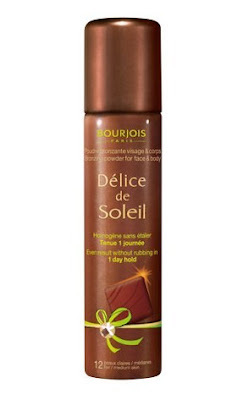 This sublime bronzer gives all complexions a natural tan. Its ultra fine texture offers a smooth and ultra-natural tan while remaining transparent. The compact mirror has a panoramic 360-degree turns and folds completely. Accompanied by a special brush for application. What could be simpler than a powder spray? This bronzer spray is for both face body. In a single step, simple and fast, a mist of powder is deposited gently on the skin. The powder is so fine that you immediately get a perfect tan- natural and smooth. No need to wait before dressing! Texture powder dry immediately. I want them all! I just hope they launch them here. Soon! I want the spray on tannnerrrrrrr!! You had me at "cocoa bean". XD As I tend to be a bit clumsy, I think the powder bronzer would be nice to try! cocoa bean, ah so tempting!